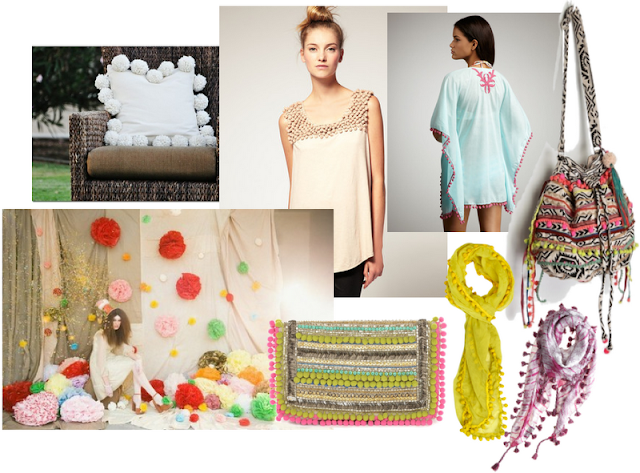 Pardon me while I obsess over everything and anything with pom pom trim on it. Who would have thought?! I love the Matthew Williamson clutch so much, I'm thinking about diy'ing a similar clutch a la Court & Hudson. ME tooooooo...obsessed with the pillow. in love with that cover up!! the indie hippie style is adorable! habibti merci :-) thanks for stopping by! and don't mind me as i obsess over these too! all so gorgeous! ohh that tribal print bag is amazing! love it! POM POMS!!!! WE LOVEEEE THEM!!! We even own pom dogs!!! hahaha...not the same but the same word! haha! We love pom poms soo much we made ourselves pom pom tights, hats with big pom poms and sweaters......just sooo cool! Oh my goodness pom poms! They always have such a cutesy feel, but this examples are so chic and have a sophisticated edge. That cover up is GORGE! MMM LOVELY POST:)I really like your blog and I want to follow..do you have twitter or FB? ?